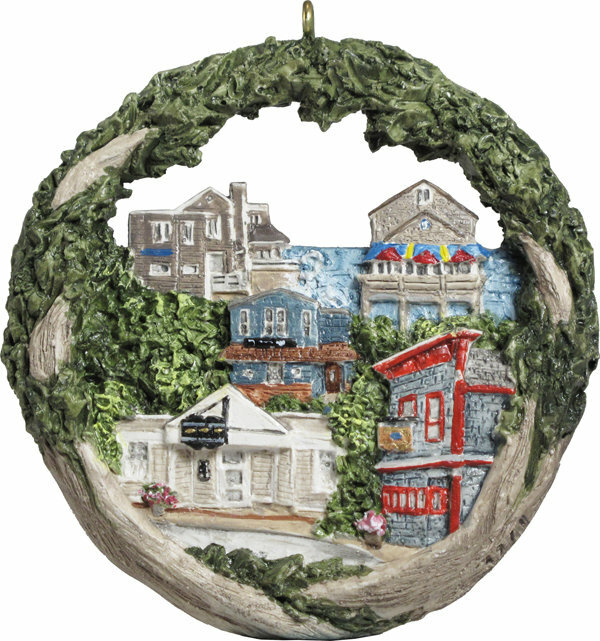 The 2017 Annual Marblehead Ornament the Marblehead Pub Crawl Tradition. Marblehead. A town of many traditions. One of those traditions is the Pub Crawl. The Pub Crawl can happen at any time, but especially during that peculiarly New England storm called the Nor'easter. Time of high tide is noted, and many head to the Barnacle (or the 'Nickle) where large waves crash over the building in spectacular fashion. The excitement of the large waves lasts but a short time, and it's time to move on to the Landing (or the 'Ding) and the cozy warmth of their pub for a pint or two or... Next in this time-honored tradition is a stop at Maddie's, known far and wide as one of the top ten sailors' bars in the world - and for strong drinks. The next decision: Do we go over the hill" to the Three Cod Tavern? So it's off we go over the hill past Abbot Hall to the newest (yet no less sacred) pub in town, perhaps for a snack. The spot for the final round is the Riptide (or The Ripper) for last call and maybe a game of pool. Five distinct personalities to discover. Are you ready? The Barnacle: For over 65 years, the Sahagian Family has been serving great drinks, seafood and lobster from their own boat at this harborside location with spectacular views. The Landing has been a popular waterfront pub and restaurant for meeting and making friends since 1972. Its cozy pub and waterfront dining room make it a popular destination for tourists as well. Maddies: The sign might say The Sail Loft, as it once was, but for over 65 years it has never been called anything but Maddies. Long known as one of the top ten sailing bars in the country, it's often a first stop for sailors after arriving in town from the sea or shore. The Three Cod was founded by Maddie's long-time head bartender, Chip Percy. Named after an old tavern on Front Street, The Three Cod Tavern. The 'Cod quickly became a local favorite. The Riptide Lounge has been a favorite haunt of 'Headers since 1972, and many tourists enjoy its authentic local feel. Lovingly called The Ripper.